In 1968 my grandmother who lived in Mobile, AL at the time bought a gold 1968 Mustang coupe with a 289 cubic inch V8 and a black ragtop. To the left is the earliest photo we had of the mustang in it's mostly original state. Notice the oversized rear tires? It's safe to say my Dad had started driving it at this point. 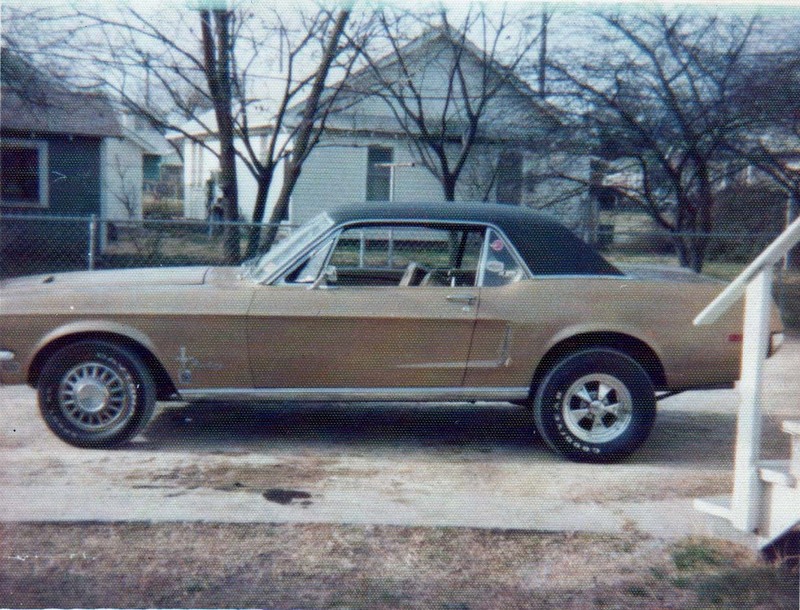 By 1970 my Dad had started driving the mustang as his first car. Shortly afterwards he met my mom. I grew up hearing stories about the mustang from around this time. Chasing jack rabbits in the field was one of the favorite stories for my grandmother to tell me. My dad swears it was someone else. Jumping the railroad tracks? That was probably not someone else. Only the rabbits and the tracks know the truth. 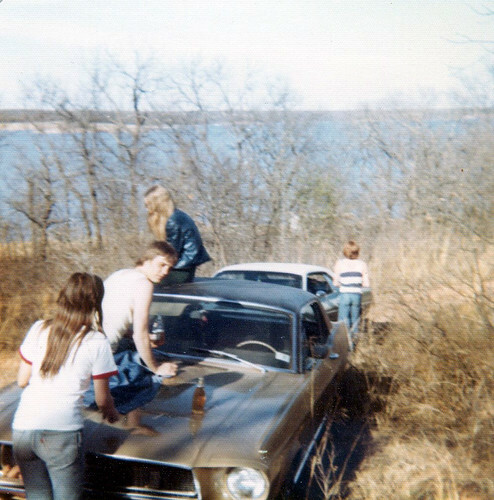 To the right is a photo taken of my dad driving the mustang to the lake with a group of friends piled in. The photo was taken from my uncles Hemi Cuda. Below is one of my favorite photos of the mustang, aside from breaking my first cardinal rule of not climbing, touching, breathing on or sneezing near my car, this photo reminds me of the song 1979 by the Smashing Pumpkins. Even though it was roughly 1968 or 1969. In 1976 my dad bought a white 1972 Mach1. For a while my mom and dad drove both cars, driving the 68 now and then until about 1980 when the 68 mustang was parked in my grandmothers garage with the intentions of fixing it up with some paint, some engine work, etc... Unfortunately that is where the mustang sits to this day in gray primer, dry rotted tires, and a completely siezed 289 cubic inch paperweight. In september of 2010 we are taking a trip to Oklahoma and I am bringing my unicorn home to restore it. I might cry. 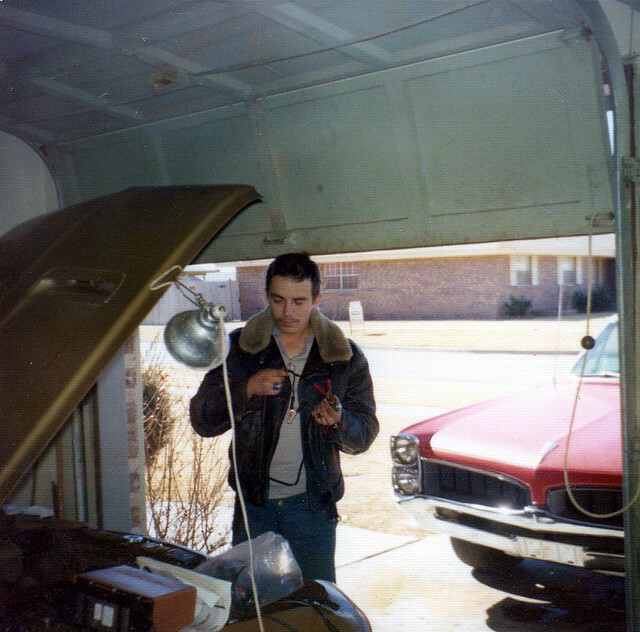 Here's my dad working on the mustang. This is shortly after he got back from the Air Force. This is where the car sits today, minus the paint. He used to work on the car Monday through Friday and race for pinks on the weekends. We still own the car, so it's safe to say it didn't lose very often. I grew up with those stories too. It's probably because of all of those stories that I grew up with a love for cars. Stay tuned for more 'Mustang Chronicles' coming soon. Written by: Shelby on June 14, 2010. 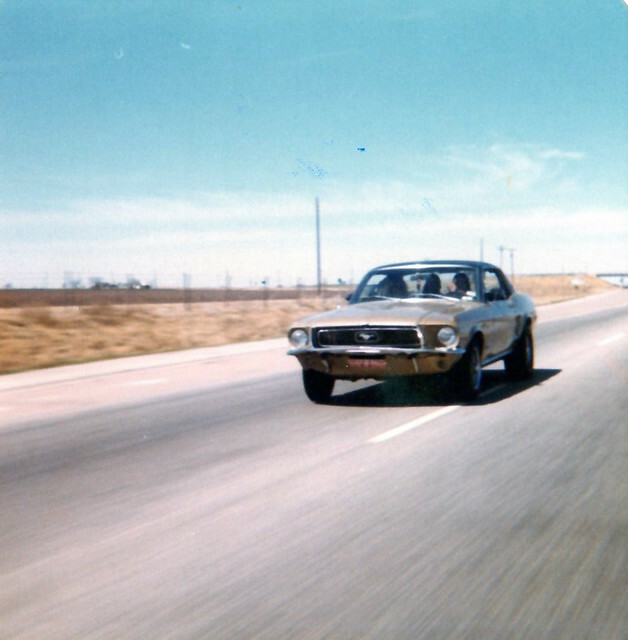 Had some good times at the Lake Thunderbird, Tuner Falls, Holly’s Drive Inn and Drag Racing south of the Airport in Oklahoma City with the Mustang. I found a ticket for Holly’s Drive In under the carpet. I still have it.